FOR A LIMITED TIME SAVE UP TO $1,500 ON ALL IN-STOCK 2018 (or prior) BONNEVILLE T120’S, T100’S, STREET TWINS AND STREET SCRAMBLERS! OR TAKE ADVANTAGE OF FINANCING AS LOW AS 0% FOR 48 MONTHS OR 3.99% FINANCING FOR 60 MONTHS – EITHER WAY YOU SAVE BIG DURING TRIUMPH’S SPRING UNCHAINED PROMOTION! THE TIME TO BUY THE TRIUMPH OF YOUR DREAMS IS NOW!! 2018 Triumph Bonneville T100 Black is loaded with urban style and attitude. The 900cc engine has been designed to deliver much more power and torque where you need it-between 2,750rpm and 4,750rpm, to suit the riding style of this modern classic for a more thrilling and engaging ride. The 2018 Triumph Bonneville T100 Black, delivers 22% more power in the midrange against previous generations and a massive 18% more peak torque with 80 Nm at a low 3,200rpm. Brimming with sophistication and individuality, the T100 Black takes styling to a different level with fully blacked-out high-quality details, including wheel rims, engine finish and beautiful twin skin “peashooter” exhaust in a matte black finish for a truly distinguished look. Not to mention there is also an incredible range of over 150 premium Triumph accessories available to allow you to make it your own! 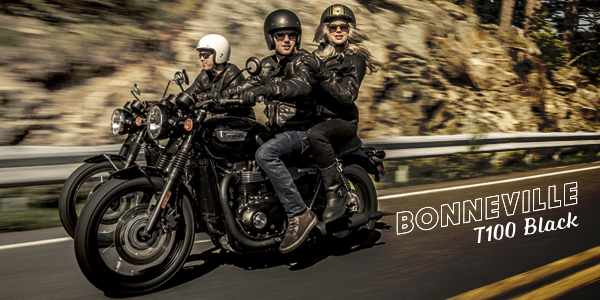 Visit Chesapeake Cycles today to see the 2018 Triumph Bonneville T100 Black in person! Instrument Display and Functions: LCD multi-functional instrument pack with analogue speedometer, analogue tachometer, odometer, gear position indicator, fuel gauge, range to empty indication, service indicator, clock, 2x trip, average & current fuel consumption display, traction control status, throttle mode status display, heated grip status (accessory) and cruise control ready- controlled by a handlebar mounted scroll button (accessory).